I’d like to meet the person who decided to compliment peanut butter with chocolate! I’d like to shake his or her hand! I’d like to say a sincere, deep rooted, “THANK YOU!” I remember eating school lunch as a grade schooler and anticipating the days that Peanut Butter Fingers were served! BEST.LUNCH.DAYS.EVER! Luckily I never had to go too long without these peanut buttery gems, because my wonderful Momma had the BEST recipe for them at home! And I’m gonna share that recipe with you right now! Treat this recipe like gold, people!!!!!!!!! 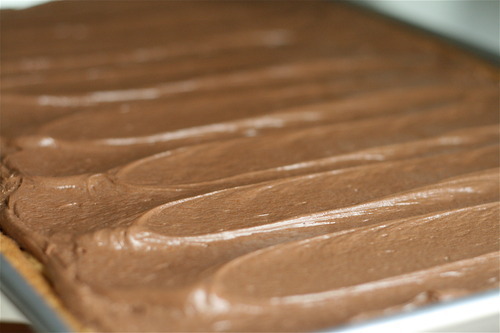 Divide dough between 2 regular rimmed cookie sheets. Press dough down evenly to reach all four corners. Bake for 15-20 min. Once out of the oven, dollop spoonfuls of peanut butter (not included in ingredients above) all over top of warm and golden crust. Once the peanut butter has melted slightly, spread evenly over top. Let cool. 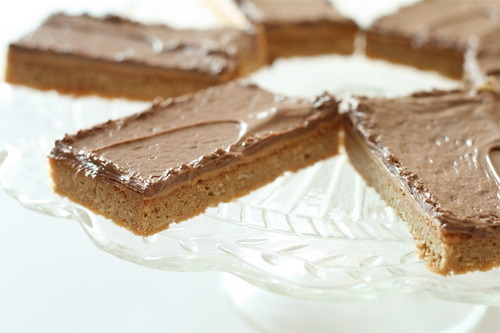 Spread over cooled peanut butter fingers, cut into rectangles and DEVOUR!